Each October, when towns in Western North Carolina and around the world celebrate that unabashed German tradition that involves oompah bands, brats, beer, lederhosen, and dirndls, a wedding celebration probably isn’t what comes to mind. Yet, it was the marriage of Prince Ludwig of Germany and Princess Therese of Saxony-Hildburghausen on October 12, 1810, that spurred the raucous tradition. The original wedding celebration, complete with a horse race, was so popular it became a yearly event, eventually earning the name Oktoberfest. Two centuries later, carnival rides and live music have replaced the horse race as entertainment, and beer tents have given way to massive beer halls. In Munich, all beer sold at the festival (an estimated six million liters each year) must be brewed within city limits, and only six breweries are allowed to supply libations. On the local front, October brings plenty of opportunities to celebrate this custom, with each event presenting a different take on tradition. Like Munich, Beer City USA doesn’t compromise on its suds. Six Buncombe County breweries will be filling glasses with spicy pumpkin ales and malty Märzens, among other flavors. 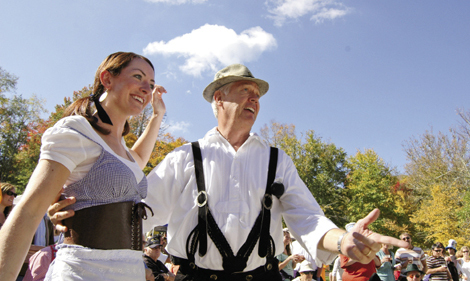 Bavarian tunes, barrel rolling contests, and German dress lend authenticity. Appalachian influence. Craft vendors, a kids area, and the chance to ride the ski lifts at Sugar Mountain Resort for breathtaking vistas make this a high-altitude party.